Covering Protests, Al-Jazeera Boosts Fans, Enemies The 24-hour independent Arab news network has seen a recent drastic increase in viewership — and data show 60 percent of newcomers are from the U.S. But Arab governments also are paying closer attention, with some doing all they can to prevent the news from getting out. Staff members of Al-Jazeera prepare for a broadcast in Doha, Qatar. In the darkened control room of news network Al-Jazeera, more than a dozen screens show reporters ready to go. Pictures are set to roll from hot spots across the Middle East, and director Charlie O'Kane chats with a correspondent in Bahrain. It's the top of the hour and Sami Zeidan, a veteran news presenter, gets ready for live coverage of one of the most challenging stories of his career. "The sense of empowerment has swept individuals in a way in the Middle East that is really unprecedented," he says. Coverage of protests in the Arab world have led to Al-Jazeera's growing popularity in the U.S. — and more powerful enemies in the Middle East. Arab governments routinely shut down Al-Jazeera's satellite signal. Satnam Matharu, the director of communications, is reading an e-mail alert: Al-Jazeera's signal is down again. Later, the network announces that the culprit is the Libyan Intelligence Agency. Matharu says it's all part of the playbook of Arab autocrats. Sheik Ḥamad ibn Khalīfah Al Thani, the Emir of Qatar, founded Al-Jazeera in 1996. In 1999, it began broadcasting continuous programming. By 2000, Al-Jazeera's programming was seen 24 hours a day in more than 20 countries. It launched an English-language branch in 2006. "So, the reason that we get cut off on a regular basis, our signal gets hijacked, disrupted, blocked, you know, turned off, shifted on the same satellite so people can't find us, governments are not happy to see what's actually happening on the streets," he says. 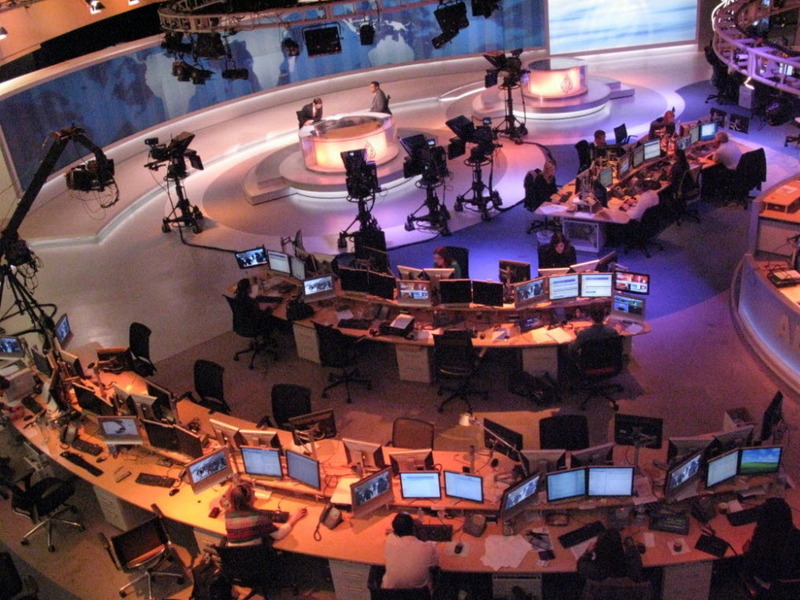 Al-Jazeera Arabic has been controversial since broadcasts began 15 years ago. The Emir of Qatar launched and funded it to provide independent news, an alternative to Arab state-controlled media. Al-Jazeera English launched in 2006, employing an international staff including veterans of British and American networks. But reluctant cable operators shut it out of the American market after the Bush administration labeled the network "anti-American." In the newsroom, journalists and editors are constantly checking for updates and the latest images. When the first protesters went out on the streets in Tunisia in December, Al-Jazeera was on the ground. The network moved an army of correspondents to Egypt and broadcast live through 18 days of protests, despite the government's efforts to stop it. Al-Jazeera's office was closed and burned. Journalists were beaten and detained. Tapes were confiscated or destroyed. They've cut Internet, they've cut telephone services, they've tried to disrupt television signals, but people are still protesting. And I think they have real concerns, which have built up over decades. And the sooner that governments start to pay attention to that the better it will be for people, I think. Heather Allan, the head of news gathering, says that when government thugs were unleashed against her reporters in Cairo, they found new ways to report the news. "I mean, the crowds were actually coming after us, they were coming for Jazeera," she says. "We went from safe house to safe house. And we did it the same way, cell phones, flip cams, small cameras, BlackBerrys, just small little devices and getting it out anyway we could." Using cell phones and computers also plays plays a large role in news coverage. At the social media office, six young reporters scan Twitter feeds, Facebook postings and Youtube videos. Department head Riyaad Minty developed a site called Witness, where people can upload videos, mostly from cell phones. The team then calls the number and checks out the source. "I think the last count to date was about 1,600," Minty says. "This was over the last two weeks. These are directly from people to Al-Jazeera, from people in Algeria, Yemen, Libya as well." Recent pictures sent from Tripoli, the Libyan capital, show anti-government graffiti. Libyan leader Moammar Gadhafi has banned most foreign journalists and has singled out Al-Jazeera specifically, calling its correspondents "misleading dogs." 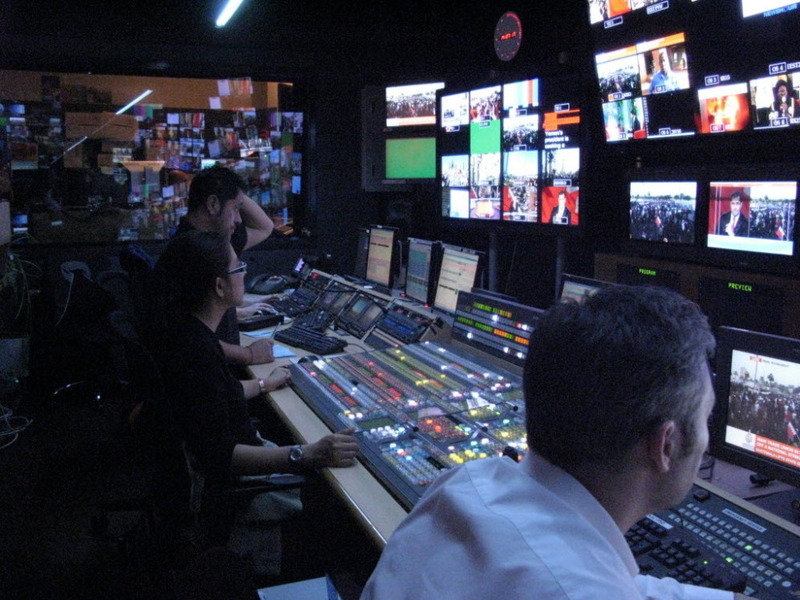 Al-Jazeera staff members prepare for a broadcast in Doha, Qatar. "There is so much attention on Al-Jazeera. And a lot of governments are fearful of Al-Jazeera's ability to cover the Middle East, which is really unrivaled," Zeidan, the veteran news presenter, says. And as for critics who say Al-Jazeera is inciting the protests sweeping the nation, Zeidan has an answer: "They don't understand their own streets." "They've cut Internet, they've cut telephone services, they've tried to disrupt television signals, but people are still protesting," he adds. "And I think they have real concerns, which have built up over decades. And the sooner that governments start to pay attention to that the better it will be for people, I think." Zeidan says he is aware of the wrath of Arab leaders and the swell of news viewers, many from the U.S.
Al-Jazeera's coverage has won praise from major American commentators, and Matharu says the number of clicks on Al-Jazeera's live stream available on the Web and Youtube measures its growing attention. "We had figures that indicated that we had 2,500 percent increase in traffic; 60 percent of that traffic was from the United States of America," he says. Many reviewers say this is Al-Jazeera's moment — the network most watched in the Middle East has proved there is an American demand as well — and the English channel wants to turn that success into access to the American cable market.